The Arctic Fox definitely gets attention out there due to the color it offers. In the winter months it is white so that it blends in very well with the snow all around it. In the summer months it is brown so that it blends in nicely during that time of the year as well. The adults range in size from 5 to 20 pounds. The males are larger than the females but the overall size is often determined by their diet. The Arctic Fox is comfortable living where it is extremely cold due to the thick fur on their bodies. They also have thick layers of fat that offer them the insulation that they need. They even have fur that is found on the bottoms of their feet. This is a characteristic of their anatomy that allows them to maintain their body heat. It also makes it possible for them to move around on the ice without falling down. They feature ears that are very long and pointed at the top. They also have a long nose that isn’t very wide. Both features allow them to have a great sense of smell and they can see very well at night. That is important because they are nocturnal animals. The evolution process for the Artic Fox is one that involved them being able to survive in a new environment. It is speculated that something occurred long ago that caused them to move into this very cold area. More than likely that was due to a search for food during the Ice Age. 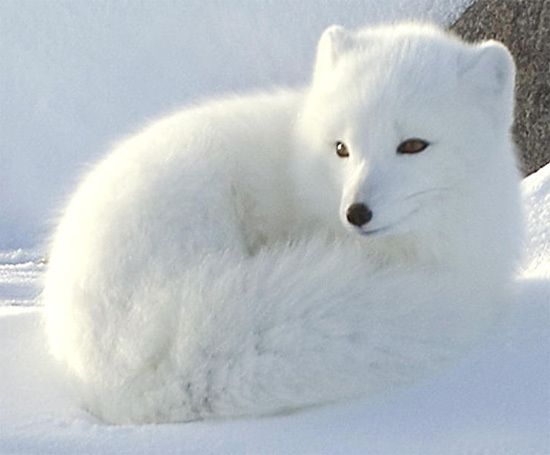 The coloring of the Arctic Fox – white most of the year – is definitely due to the evolution process. They needed this color in order to survive from prey. Their thicker coat than other species is due to the fact that they need to stay warmer. This is also why they are one of the few species that have fur on the feet. Others that do so live in the desert so they need the fur to prevent burning their feet. The Arctic Fox is quite social which is very interesting. Other species of fox tend to spend their time isolated unless they are with a mate or they are taking care of young offspring. They are able to recognize each other through scent. The female offspring that go off on their own often come back to visit their mother later on. They can even have a home territory that overlaps. It is believed that the Arctic Fox is responsible for introducing rabies to the area of Newfoundland in 1988. As a result many people are nervous should they see one of these fox out during the day. However, that doesn’t mean they have rabies even though they are generally going to be active at night and not during the day. They may be out during the day in search of food. This is especially true when there are young to care for in a den. As you can figure out by their name, the Arctic Fox lives in the below zero temperatures of the Artic. They are one of the few types of animals that are able to live in this very cold location. As a result they have a wide home range and they don’t often have to worry about humans coming in and taking it over. They prefer to live in locations where there isn’t too deep of snow. This is why they are often found around the frozen ice of the waters. Even though their bodies are designed for the cold, the Arctic Fox has to find shelter from it. They have tunnels that are underground and they can travel long distances within the complexity of them. They can find food sources in these tunnels too so it can be days before they are above ground during the coldest temperatures of the year. Their dens are also underground and often the tunnels that they made end with their den. Since there aren’t very many other animals that live in the Arctic region, this fox has to make the most of any possible food source it comes into contact with. They are often able to hear their prey under ground before they actually see it. They can be above the snow too and still hear the prey moving. Then they leap on it from above and take it down. The majority of the food that the Arctic Fox consumes is Lemming. They also will eat fish and baby seals when they have the opportunity to do so. What they have access to often depends on the part of the Arctic where they live and the time of year it happens to be. Eggs from a variety of types of birds are something that they will consume as well when they have the opportunity to do so. The Artic Fox will also scavenge the remains from other animals that are left behind. This is unusual for the fox, but also one more way that they are very adaptable to such an environment. The Polar Bears often leave lots of the seals they kill behind and so it isn’t uncommon to see the Artic Fox coming along and benefiting from that. The Arctic Fox has a very long mating season – the only months when they don’t mate are from June through August. What is very interesting is that a pair will decide to mate and then they are going to do so year after year until one of them dies or is removed from that habitat. Even then it can be several years before the remaining fox is willing to mate with another. The litters of young can be as high as 25 which is much more than other species of fox. However, they also have an extremely high mortality rate. Most of the time the litter averages 6 offspring. If the parents are lucky 1 of them will survive to the age of maturity when they can mate themselves. The high mortality rate has to do with the environment where these animals live. They weigh less than 1 pound at birth so the mother has to keep them very warm. Both parents take a very active role in raising the young and they are very patient with them. The female will stay with the young in the den to offer heat and milk from her body. The male will help to protect them and to go find food for the female to survive on. Other animals in the Arctic are also looking for food sources. Some of them find the Arctic Fox to be just what they were looking for. Some of these predators include the wolf, Polar Bears, and the Golden Eagle. They are all skilled hunters that are fast and very powerful. It is the young fox that is the most vulnerable to these types of predators. Even though there aren’t too many humans in the Arctic regions where this fox lives, they do have problems with them. It isn’t uncommon for humans to want to hunt this very original looking fox. They are often hunted for the sport of it and for the desire to have their beautiful thick coat.